Brand spankin' new to our area Bi-Lo's are fuelperks! I am really excited about this program. What is Fuel Perks? Basically you earn free gas for shopping at Bi-Lo. You will have to sign-up for a new Bonuscard that can be scanned at the gas station. For my area the only participating gas stations are Shell, but they did tell me they are trying to add more locations than just Shell. 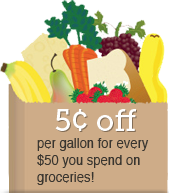 For every $50 you spend at Bi-Lo you'll earn $0.05 off per gallon of gas. They also run special fuel perks promotions on certain items in the store to earn additional fuel perks. Head over to the Bi-Lo website to watch a short video on how fuelperks work and you can also enter your zip code to see which gas stations are participating near you. Did you know you can also easily load e-coupons to your Bi-Lo Bonuscard? See my post HERE about Bi-Lo e-coupons. My friend Maranda is also having a $25 Bi-Lo gift card giveaway on her website FrugalFreeloader.com. Enter to win!